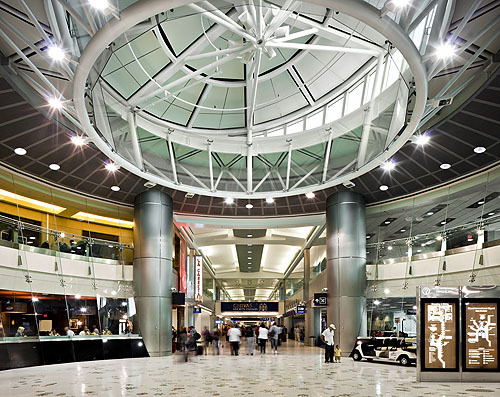 Miami International Airport (MIA) has embarked upon a major Capital Improvement Program (CIP) which includes the refurbishment of Terminal interiors and construction of new concession locations. 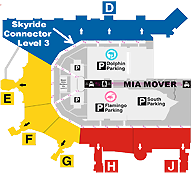 There are approximately 225 existing retail, duty free and food and beverage locations at MIA. The North Terminal has approximately 61% of the passenger traffic. The North Terminal has 147,302 square feet of existing concessions space. There are 8 duty free stores, 15 news & gift stores, 38 specialty retail store and 47 food and beverage locations. Current food & beverage concessions include Jose Cuervo, Starbucks, Café Versailles, Au Bon Pan, Islander Bar & Grill, Villa Pizza, Manchu Wok, La Caretta, Corona Beach house, Sushi Maki, Shula’s, Haagen Dazs, Pizza Hut, Beaudevin, Ice Box Café, Nathan’s, Clubhouse One, Clover Irish Pub, Einstein Bros. Bagels, Fig & Fennel, Estefan’s Kitchen Express, Half Moon Empanadas, Chefs of the Caribbean, 305 Pizza, My Ceviche, Wendy’s, Kuva, The Counter and the Mojito Bar. There is also a Kentucky Fried Chicken-Taco Bell-Pizza Hut combination unit in pre-security. Specialty Retail includes: Booklink Café, Books & Books, Bijoux Terner, Inmotion, Sound Balance, Coco Bay, Miami To Go, Sunglass Hut, Starfire Design, Taxco Sterling, Tech on the Go, Michael Kors, Sweet Indulgences, Johnston & Murphy, Miami Gifts to Go, Shops of Ocean Drive, Brito, Air Essentials, Victoria’s Secret, XpresSpa, Miami Heat, Cuban Crafters, Miami Marlins, Perry Ellis, Thomas Pink, Emporio Armani, Coach, Calvin Klein and MontBlanc. Interior view of MIA's Central Terminal - Photo by Miami-Dade Aviation Dpt. The Central Terminal is located between the North and South Terminals and is now known as Terminals/Concourses . The majority of the concession space is located in the pre-security portion of the Terminal. Existing concessions include 6 duty free stores, 7 news and gift stores, 18 specialty retail store and 24 food and beverage locations totaling 72,094 square feet. Food offerings include Subway, Burger King, Starbucks, Sam Adams, Pizza Hut, Worldwide Café, Café Versailles, Sbarros, Chili’s Too, Guava Java, Villa Pizza, Au Bon Pan, Dunkin Donuts, and Half Moon Empanadas. Specialty retail includes Havana Nines, Mindworks, Brookstone, Leather & Company, Bijoux Terner, Ron Jon, GNC, InMotion, Travel Bags & Co., Bayside Brush, Time 4 Shades, Time 4 Books, Affordable Luxuries, Mercado Miami, and Tech on the Go. The South Terminal accommodates the Star Alliance and Skyteam Alliance, which includes United Airlines, U.S. Airways, Delta Airlines and their code share and marketing Alliance partners. Approximately 20% of all passenger flows through the South Terminal. 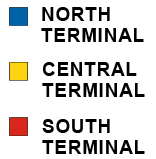 The existing South Terminal and its related concourses (H and J) have 5 retail and 9 food and beverage locations totaling 10,500 square feet. Food and Beverage offerings include Heineken Bar, Starbucks, Subway, Nathans, Quiznos, Bud Brewhouse, Earl of Sandwich and Corona Beach House. Specialty Retail includes the Bead Factory, Bijoux Terner and 3 news and gift locations. There is also a full service banking branch in the pre-security area. This terminal has approximately 42,000 square feet of concession locations. The food court offers casual dining in its La Pausa restaurant unit. La Pausa, is joined by McDonalds, Gilberts Food Bar, La Famiglia Pizza, Illy Café, Jamba Juice, and Island Chicken Grill. The entire assortment is topped off with Bongo’s Bar. Sandwiches and pastries can also be found in the Cafe Brioche Dorre as part of the Simply Books bookstore. Specialty retail includes, Havana To Go, Miami Gifts To Go, Sunglass Icon, Sunglass Hut, Addixion, Jetsetter Spa, Navarro, Brookstone, L’Occitane, Bijoux Terner, Taxco Sterling, Fire CZ, Tous, Tumi, InMotion, Sound Balance, MAC, Desigual, Coach, Tommy Hilfiger, Michael Kors, and Victoria’s Secret as well as an assortment of news and gift stores.